Atos today announces that it has been named a ‘2017 Best Outsourcing Thought Leadership Awards (BOTL)’ winner, for the ‘Case Study for Cost Saving’ Award. 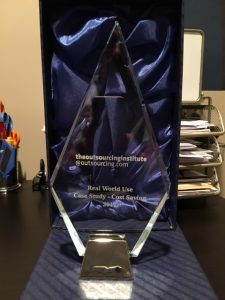 The awards, run by The Outsourcing Institute, the largest, neutral professional association dedicated solely to outsourcing, recognize the industry's foremost thought leaders and organizations with outstanding client case studies. The BOTL Awards’ Digital Convergence showcases the most innovative work from providers across the outsourcing industry. This award recognizes Atos’ work in partnership with NS&I, one of the largest savings institutions in the UK, to create customer centric services, reduce costs and increase productivity through business transformation. The partnership is one the most ambitious outsourcing contracts in the UK, with committed savings of over £1Billion realised by 2021 and over the period of the partnership, NS&I has transformed its efficiency ratio from over 30 basis points to just 10 basis points, a 300% productivity improvement. Together, Atos & NS&I also created NS&I GPS (Government Payment Services), which leverages NS&I’s banking platform to offer payment processing services to other parts of government including the Ministry of Justice, the Home Office, HMRC and the Department for Education. A judging panel of six senior sourcing executives from Fortune 1000 enterprises selected Atos for its real world use case that encompasses innovation, creativity and results. The award was presented on 27th September at the Digital Convergence Conference, held at PwC in New York City.